If you have read one of our other blogs, you would have probably seen we often use the saying camp friends are the best friends. They really are! Whether you are a camper or part of our staff team, you will be spending your time away from camp counting down the days until you are reunited again. There will not be many places that you will visit in life where you will make friends for life in just a week. We wish we could see our camp friends every day! Our camps are hosted in the most beautiful locations. For many of us who live in big cities, as much as we love city life, it’s always nice to get away from the high rise buildings and traffic and spend the summer breathing in the fresh air. Being outside also means we have freedom to run (on camp of course) and spend our summers being active. 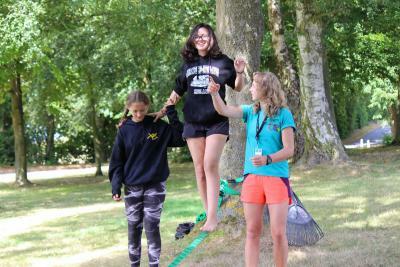 There is such a vast range of activities on offer at camp with something for everyone. As staff it’s amazing to watch our campers have fun, try something new and sometimes discover new skills and talents. After a year of being stuck inside, whether that’s a classroom, lecture hall or office, it’s great to get up on our feet, let our creative juices flow and have some healthy competition. We are incredibly lucky to have kids & teens attending our summer camps from all over the world. We have seen so many of them start with us as 7, 8 and 9 year olds and continue coming until they reach late teens. Watching them grow into respectful, young adults is amazing to see. Occasionally we have first timers arrive who are a little homesick. It is amazing to see how they change during their stay with us and leave with so much more confidence and pride that they stuck it out. It also makes us smile every time we see pictures of camper reunions happening all around the world. It’s not easy getting a job with us, because we pick the very best staff. Our team is made up of awesome people from a whole range of background from university students to qualified teachers and sports coaches to medical students. Some have louder personalities whereas others bring outstanding organisational skills and we believe that’s what makes the perfect staff team – a great balance of personalities and skills.